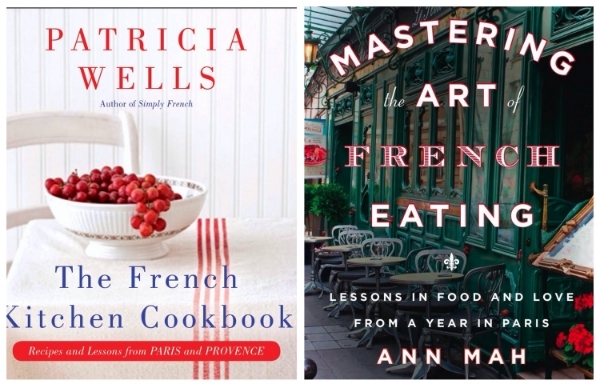 It's wonderful to be home in Paris after my chock-a-block US tour for The French Kitchen Cookbook. Thanks to everyone who came along to the events, it was great to meet all you food lovers! The tour continues in Paris however, with an event next Tuesday, December 17 at WH Smith, from 6-8pm. I'll be signing books from 6 to 7pm, with a presentation from 7 to 8pm. I'd love to see you there! 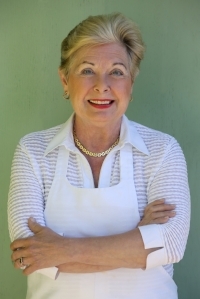 This week I have been fortunate enough to participate in Nutritious Life Week at the Golden Door Spa in Escondido, California. Along with 5-mile morning mountain hikes, classes in Fast Fit, daily workouts with my trainer, strenuous water aerobic classes, and daily tennis lessons, the days are sprinkled with massages, manicures, pedicures and facials. There is also time for me to talk to the guests about my own fitness program, my cooking, and signings for my new book, The French Kitchen Cookbook. Pictured above are a few guests enjoying the spa's first outdoor picnic, held overlooking the 3-acre organic vegetable garden, a paradise that right now is bursting with multiple varieties of beets, carrots, fennel, kale, society garlic, nasturtiums, oregano, and Mexican tarragon. Tonight, in our cooking class, we sliced many of these vegetables paper-thin, blanched them, then tossed them with an avalanche of herbs and a Yogurt, Lemon and Chive Dressing (recipe follows.) We also prepared a lighter variation of my Miniature Onion and Goat Cheese Appetizers, as well as Grilled Polenta Squares with Tomato and Onion Sauce, both variations on recipes from The French Kitchen Cookbook. Equipment: A small jar, with a lid. In a small jar, combine the lemon juice and the salt. Shake to dissolve the salt. Add the yogurt and chives. Shake to blend. Taste for seasoning. Store covered and refrigerated, for up to 1 week. Shake to blend again before using. These tasty, savory, miniature appetizers are a huge hit in my cooking classes. There is always a great sense of satisfaction, when one removes a tray of these fragrant, golden nuggets from the oven. These are best warm from the oven but are also delicious at room temperature. They can serve as appetizers or as sides to a simple green salad. Equipment: A food processor; 2 nonstick petit four molds or mini muffin tins, each with twelve 2 1/2–inch (6.5 cm) cups, or a 24-cup mini-muffin pan. Evenly center two racks in the oven. Preheat the oven to 400°F (200°C). In a skillet, heat the oil over moderate heat until hot but not smoking. Reduce the heat to low, add the onions and a pinch of salt, and sweat – cook, covered, over low heat until soft and translucent – about 10 minutes. Season generously with freshly ground black pepper. Taste for seasoning. In the food processor, combine the goat cheese, lemon zest, eggs, and thyme leaves and process to blend. Add the cheese mixture to the onions in the skillet and stir to blend. Taste for seasoning. Spoon a tablespoon of the mixture into each mold or muffin cup. Place the molds in the oven and bake until the mixture is golden, 20 to 25 minutes. Remove from the oven and let cool slightly. Then remove them from the cups. Serve warm or at room temperature, sprinkled with fleur de sel. Wine suggestion: The mineral-rich flavors of this blend of Marsanne, Clairette, Ugni Blanc and Bourboulenc with their touch of spice make this white wine –Domaine du Paternel Cassis Blanc de Bancs -- a perfect palate opener to pair with the tatins. This light, colorful vegetarian weeknight dinner is a favorite, and this soothing, comfort-food dish knows few rivals, particularly in cooler weather. Equipment: A 1-quart (1 l) gratin dish, 4 warmed dinner plates. 1. In a large saucepan, bring the milk, 1 teaspoon of the sea salt, and the nutmeg to a boil over medium heat. (Watch carefully, for milk will boil over quickly.) Add the polenta in a steady stream and, stirring constantly with a wooden spoon, cook until the mixture begins to thicken, about 3 minutes. 3.Prepare the tomato garnish: In a large skillet, combine the onion, the olive oil, and 1/2 teaspoon of the sea salt and sweat – cook, covered over low heat until soft and translucent – about 5 minutes. With a large pair of scissors, cut the tomatoes in the can into small piece. Add the bay leaves and tomatoes and their juices and cook, covered, over low heat for about 15 minutes. Taste for seasoning. 4.At serving time, preheat the broiler. Cut the polenta into 8 even squares. Place on the baking sheet, cheese side up. Place under the broiler and broil until the cheese sizzles, 1 to 2 minutes. Transfer the squares to the warmed plates, stacking the second slice at an angle over the first. Spoon the sauce all over. Garnish with parsley and cheese. MAKE AHEAD NOTE: Both the tomato sauce and the polenta can be prepared up to 3 days in advance, then covered and refrigerated separately. Reheat at serving time. When the Fed Ex van made it to the top of our Provençal hill on a late summer morning, it was a much happier occasion than many of this summer’s deliveries, a long stream of page proofs and editorial requests that Patricia has described as “publishing hell. ” Hell is over, and the heavenly results are apparent elsewhere on the site. But back to that August morning: the delivery was from Muhlenberg College in Allentown, PA, which in May awarded Patricia an honorary doctorate of fine arts. Officials at the distinguished college had shipped the framed certificate announcing the artium doctoris; the black, white and scarlet academic “hood” the she is now entitled to wear in future academic processions; and the charming and extensive description of Patricia’s accomplishments, written by Dr. Kathryn Wixon of the college French department and read by Peyton R. Helm, president of Muhlenberg, as he conferred the degree. The mover and shaker in all this was Sandy Jaffee, who came to Provence as one of Patricia’s students and became a great friend. A retired executive vice president at Citibank, she’s on the Muhlenberg board. This was Patricia’s second honorary doctorate – the first was from her alma mater, the University of Wisconsin in Milwaukee, in 2006. 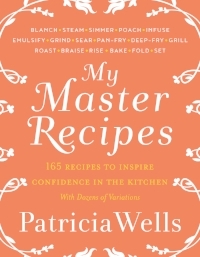 I’m posting a PDF of the Muhlenberg citation here – Patricia was resistant to the idea, but she’s not always right. Last chance to win a free Food Lover's app! 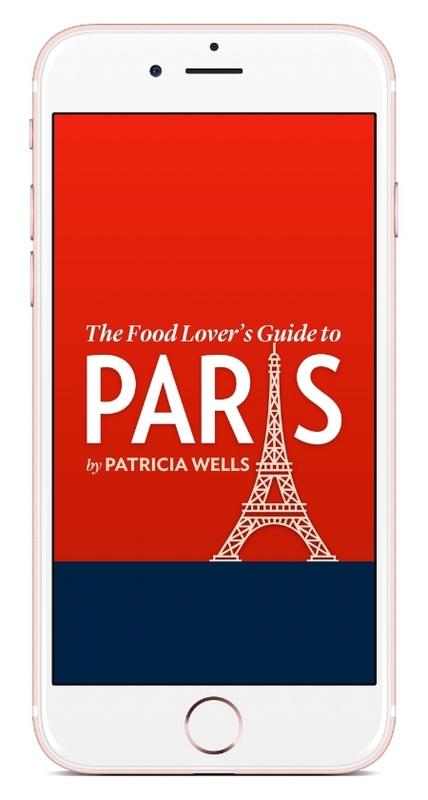 Click this link to find the entry form and win a Food Lover's Guide to Paris app for the iPhone, iPad and iTouch. You must apply by midnight EST Thursday!